Slipping the fur skin of a dead animal over a perfectly crafted taxidermy form produces a visual illusion of life, much in the tradition of a trompe l’oeil painting. In traditional taxidermy terms, the relationship between man and animal is that of a hunter conquering nature. 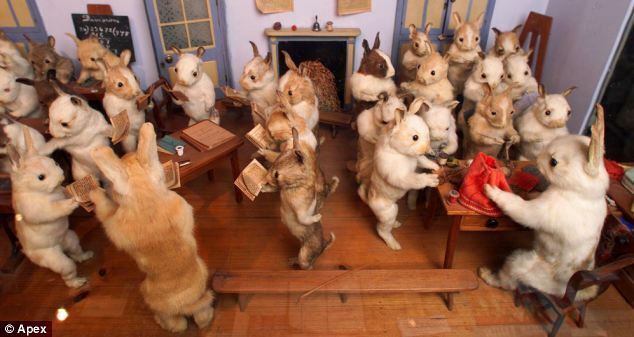 The tradition of taxidermy as art dates back to English Victorian-era taxidermist Walter Potter, who created anthropomorphic dioramas of squirrels playing cards in a parlor, a classroom of rabbits seated in rows of long wooden desks, and many other assorted scenarios that more closely resemble illustrations from a Beatrix Potter children’s book than Damien Hirst or Maurizio Cattelan’s respective, well-known animal form artworks. In the works of taxidermy art by AC Wilson and Peregrine Honig discussed here, however, the taxidermy of a young animal (or, in human terms, of ‘children’) locates the work in a tradition much more akin to Walter Potter’s delicate dioramas. Wilson and Honig’s works stand in contrast to the more brash, cynical nature of Hirst and Cattelan’s works by allowing the darker underbelly of childhood fairytale and fantasy to speak through their forms. Walter Potter was initially inspired to create his taxidermy dioramas by his sister, Jane, who showed him a book of nursery rhymes. He displayed his taxidermy works in his very own Walter Potter’s Museum of Curiosities, located in Sussex, England, which first opened in 1861; by the time of his death in 1914, the museum housed about 10,000 taxidermy objects. Potter’s dioramas embodied a sort of morbidity of childhood, which coincided with the Victorian era’s idealization of childhood, as evidenced by Charles Dickens’ portrayals of children as ‘innocents’—the symbols of all that was “good in the world,” before the onset of adulthood institutions and behaviors. Quite literally speaking, the perceived morbidity of childhood is subject of a vast visual tradition, established and popular throughout England in the late 1800s, known as post-mortem photography. Contemporary artists Peregrine Honig and AC Wilson harken back to these visual representations of dead children in artworks that suggest the absurd, circular proximity of life and death. Before we discuss these contemporary works by Honig and Wilson, however, it is important to contextualize contemporary taxidermy art. Damien Hirst’s 1991 The Physical Impossibility of Death in the Mind of Someone Living is a dead tiger shark floating in formaldehyde, preserved in a glass vitrine for the eyes of onlookers. 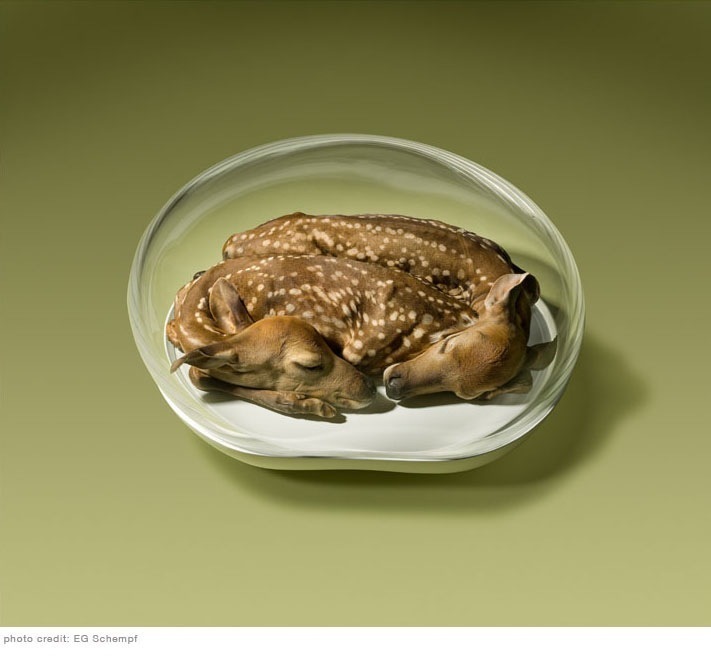 This work marked a new trend of taxidermic technique as part of ‘high art’ that often had very little to do with childhood and is likened more so to the tradition of taxidermied animals as hunter’s trophy. Italian conceptual artist Maurizio Cattelan’s satirical, morbid taxidermic sculptures utilizing horses, dogs, mice and donkeys emerged a few years later, in 1995. "We dress death in lilies and bronze the names of our dead sons on walls. we erect altars of toys and hold candlelight vigils to express hope. my twin fawns sleep endlessly on their baby blue block in my studio. the twins never opened their eyes yet their wondrous fatality evokes an acceptable alternative to death." The fawns’ exaggerated features embody a cartoonish surrealism. I have watched the twin fawns ‘grow up’ in the way that cartoons do—meaning I, the viewer, grow up, as they resemble the same age forever. Psychologically, Honig has constructed them in a fictional, virtual space, available for public viewing, much in the manner of Potter’s taxidermy art dioramas housed at his Museum of Curiosities. The shop owner sold the fawns to Honig with the agreement and understanding that she would not return them. Every night for the first few weeks after she bought them, Honig notes that she had the same dreams about them as the previous owner. Nowadays she still dreams about the fawns, but less frequently. 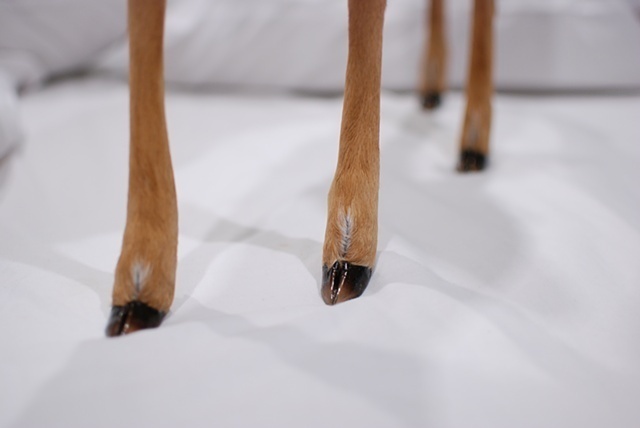 In AC Wilson's taxidermy animal series (Appear and disappear (2012), Rut (2012) and What happens when you die (2011), the artist uses a rabbit, a plethora of chicks and a single fawn to discuss loss. 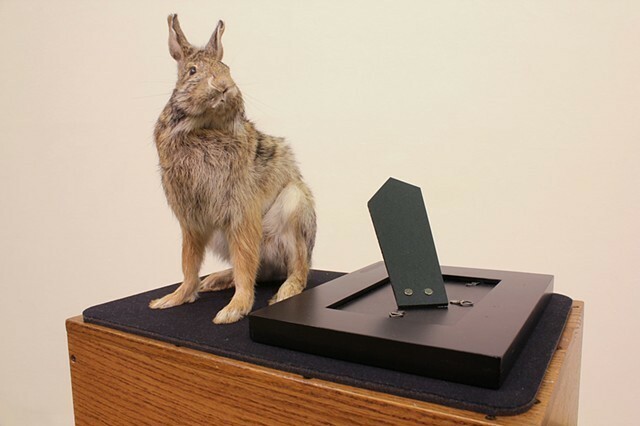 In Appear and disappear, a taxidermy rabbit sits atop a magician's stand next to a picture frame that has been turned upside down. The piece references the ‘hat-trick,’ in which a magician pulls a rabbit out of a hat, astounding onlookers. In Wilson's rendition, no such hat exists, and the rabbit's taxidermy form, instead, is the visual illusion used to reference human mortality. Rut features a grouping of taxidermy ducklings arranged in a circle on top of a clean, white pillar. There is an absurd, existential quality to these tiny birds, who are forever marching in a circle going nowhere fast. Maurizio Cattelan employs similar humor in his piece Bibididobidiboo (2012), in which a taxidermy squirrel lays slumped over a tiny table, empty shot glass nearby, a gun resting on the floor as though dropped from his tiny paws. This humorous take on suicide, or on the way we use anthropomorphism to discuss subjects deemed morbid, is ambiguous enough to be open-ended, and funny enough to make light of death. Similarly, the chicks in “Rut” march on to nowhere, suggesting a similarly absurd act of futility. 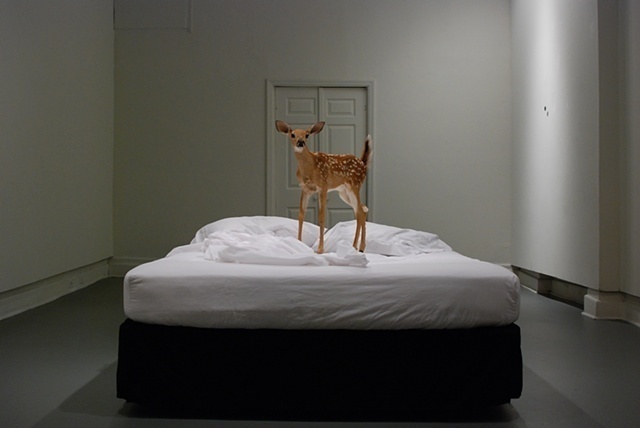 In Wilson’s work What happens when you die, a single fawn stands atop a bed, the kind it might’ve had had it been a human child. The fawn’s ears are alert, and its big, black eyes are childlike and wide-open. 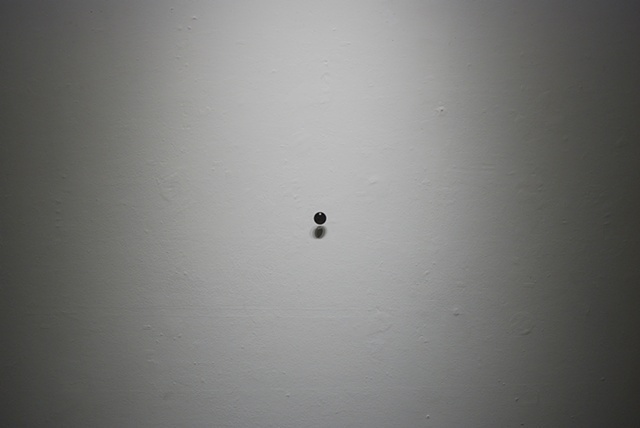 Nearby, a circular black cremation tag hangs from one of the walls. This subtle anthropomorphism of the fawn nudges viewers into imagining someone they love dying quietly in the middle of the night, only to be reawakened in this animal form. It might be the afterlife of the post-mortem childhood death, a visual representation of what would a have been a post-mortem photograph of a child during the Victorian era. The tiny fawn straightens its legs, digging its shiny black hooves into the soft white mattress. Its glass eyes reflect the white gallery light—like a ghost or, perhaps, a long-exposure mirror of death itself. "What happens when you die"
This is the first post in the OPP ART CRITICS for the OPPBlog. Look for our next installment on 5/28!